That’s how sad life is. Coming straight from my diary. I often think about it. It must be exhausting, Why our self is not enough? It must be human nature,or our own thinking that it is necessary to have someone. Maybe. More often, it’s just a Chase. I often think that’s an illusion.I’d like something positive to happen though. Go ahead. You don’t need my permission. 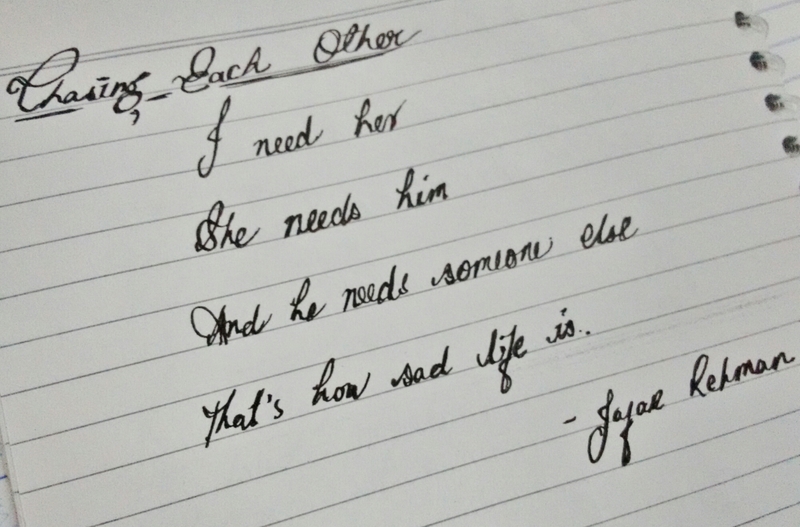 While the subject is sad, the handwriting is beautiful. It made it that much more poignant. Well,call it a coincidence or not but I never intended to do it. But yes if it helps what I wrote,then it’s good.